Steve Anson, CISSP, EnCE, is the cofounder of Forward Discovery. He has previously served as a police officer, FBI High Tech Crimes Task Force agent, Special Agent with the U.S. DoD, and an instructor with the U.S. State Department Antiterrorism Assistance Program (ATA). He has trained hundreds of law enforcement officers around the world in techniques of digital forensics and investigation. Steve Bunting, EnCE, CCFT, has over 35 years of experience in law enforcement, and his background in computer forensics is extensive. He has conducted computer forensic examinations for numerous local, state, and federal agencies on a variety of cases, as well as testified in court as a computer forensics expert. 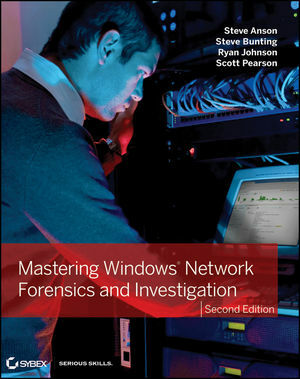 He has taught computer forensics courses for Guidance Software and is currently a Senior Forensic Consultant with Forward Discovery. Ryan Johnson, DFCP, CFCE, EnCE, SCERS, is a Senior Forensic Consultant with Forward Discovery. He was a digital forensics examiner for the Durham, NC, police and a Media Exploitation Analyst with the U.S. Army. He is an instructor and developer with the ATA. Scott Pearson has trained law enforcement entities, military personnel, and network/system administrators in more than 20 countries for the ATA. He is also a certifying Instructor on the Cellebrite UFED Logical and Physical Analyzer Mobile Device Forensics tool and has served as an instructor for the DoD Computer Investigations Training Academy. Under Field Data, the third entry "192.168.1.5" is incorrect. In the first sentence, "With this information as a backdrop, you now know that you can expect your FTP logs to read very much like your IIS 7.5 server logs, except there will be fewer fields, and the sc-status codes will be different."